Not only are runners allowed to run through the streets of Pyongyang, passing Kim Il-Sung Square and under the Arch of Triumph where normally tourists movements are strictly controlled, the race boasts an epic finish for each runner. 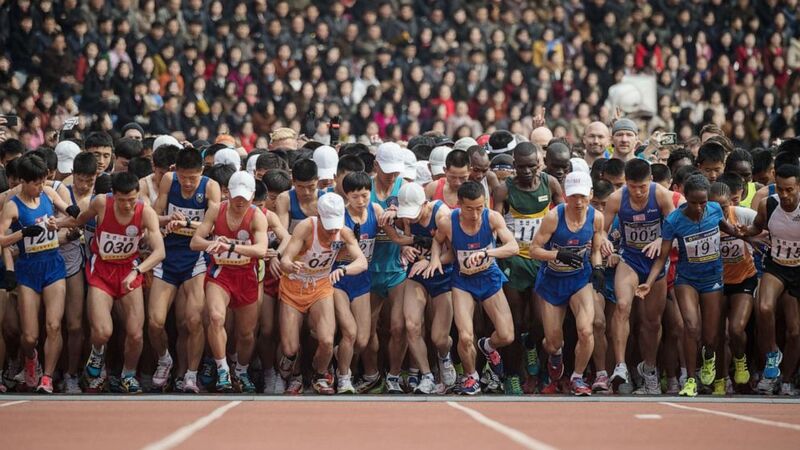 (Ed Jones/AFP/Getty Images, FILE) Competitors cross the start line of the the annual Pyongyang marathon at Kim Il Sung stadium in Pyongyang in this April 8, 2018 file photo. This will be the 30th iteration of the marathon since it began in 1981, but it will only be the sixth year the race is open to foreign amateur runners. It is shaping up to be the race’s biggest year with over 1,600 runners competing. U.S. passport holders, however, still cannot travel into North Korea, nor are tour operators like Koryo Tours allowed to register them because of State Department travel restrictions put in place after the death of Otto Warmbier, the American student who was detained in North Korea from January 2016 to June 2017. McFarland said they started signing up runners for this year’s marathon last June, soon after U.S. President Donald Trump and North Korean leader Kim Jong-un met for the first time in Singapore. Previous The Blue and White party is running on a centrist platform against Netanyahu.